These are the HyperAdapt 1.0, Nike's first performance sneaker to include adaptive lacing, and they're pretty revolutionary. They've been available in the US for a while now, and as of today they're available to buy in the UK as well. Tiffany Beers, Senior Innovator at Nike, and the project’s technical lead explains how they work, "When you step in, your heel will hit a sensor and the system will automatically tighten." Why are the HyperAdapt's so revolutionary? Well, Nike claims they challenge "traditional understanding of fit, proposing an ultimate solution to individual idiosyncrasies in lacing and tension preference." Essentially, they reduce distraction, allowing athletes to focus on the game/competition. Legendary Nike designer Tinker Hatfield explains that this also solves an age old problem - the ability to make micro-adjustments on the fly. It reduces undue pressure caused by tight tying, as well issues with slippage resulting from loose laces. “That’s an important step, because feet undergo an incredible amount of stress during competition,” he says. The technology was first debuted in the Nike Mag released in October 2015, celebrating Back to the Future. 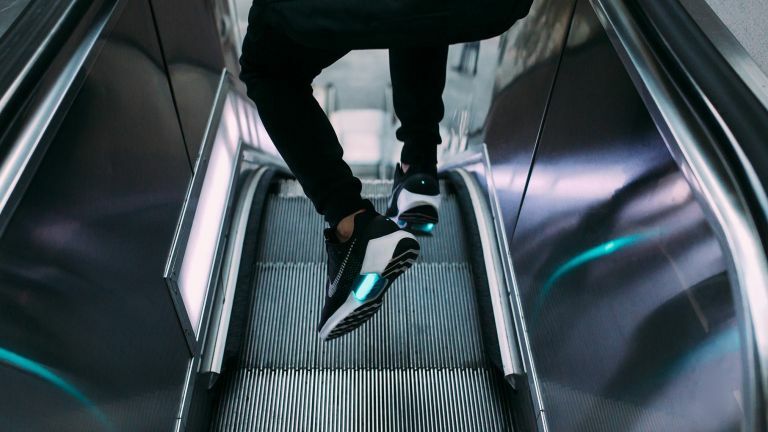 HyperAdapt 1.0, as the name clearly states, is the first step. The current limitations are clear - it's manual (you control the tightness) - but in the future Nike envisions a symbiotic relationship with the foot and shoe. “It is amazing to consider a shoe that senses what the body needs in real-time. That eliminates a multitude of distractions, including mental attrition, and thus truly benefits performance.” said Hatfield. How do I buy the Nike HyperAdapt 1.0? The HyperAdapt 1.0 are available on September 29 at Niketown London. Additionally, the shoe launches on the same day (September 29) in 19 European countries including the UK, Germany, France, Italy, Spain, and the Netherlands at 9 AM CET. You'll need to download the Nike Sneakrs app. This will allow you to order a pair, although, at the time of writing, it looks like Nike have already sold out. The retail price is $720.00 (probably around £700).